Successful leadership is the product of several factors and probably one of the most important traits of great leaders is the standards they uphold. That means building and maintaining good, positive actions, and drawing a firm and clear line at things that are unacceptable. Whilst it’s about what they do it’s also about what they’ll never do or take part in or allow in their team … i.e. things that are complete “no nos”. How many of these have you been tolerating? 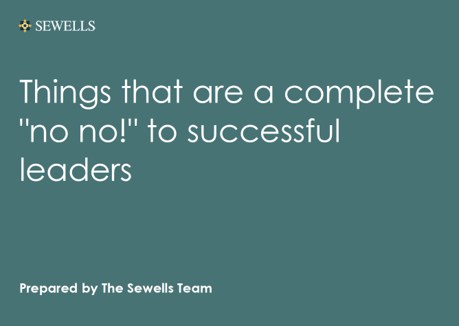 For over 55 years, we, at Sewells, have been developing world class leaders to set standards to all these things … or, put another way, the standards are to not tolerate any of them and we’ve been doing it using the tried and tested methodologies we have developed over the last half century. If, when we started the Sewells Leadership Programme 12 months ago, someone had told me the tangible progress we’d actually make, I would have said, “It would be impossible”! If your leadership’s tolerance is low CONTACT SEWELLS NOW to arrange a FREE CONSULTATION with one of our business transformation specialists – it will, we promise you, be the the most powerful and PROFITABLE 90 minutes you’ve had in years!